A number of pro-revolution groups announced they would be participating in the sit-in initiated Friday night by a group of Tahrir Square protesters in front of the Ministry of Defence. Among the participating political forces were the Youth for Justice and Freedom, the Coalition of Revolutionary Forces, the Free Front for Peaceful Change and the Second Egyptian Revolution of Rage, who announced their solidarity with the sit-in's objective, namely the abdication of the ruling Supreme Council of the Armed Forces (SCAF). 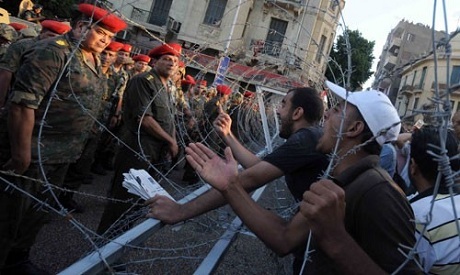 Dozens of protesters marched on the Ministry of Defence in the district of Abbasiya from Tahrir Square Friday night, following a mass rally in Tahrir Square called for by Islamist forces to show opposition to the re-emergence of Mubarak-era politicians in May presidential elections. A number of revolutionary groups had opposed Friday's Islamist-led rally, including the Free Front for Peaceful Change, on grounds that the Muslim Brotherhood is attempting to attract non-Islamist groups in order to bolster its clout vis-a-vis Egypt's military junta. Protesters at the defence ministry are demanding the military council step down immediately, raising slogans that read, "No to military rule." Other posters are calling for "redeeming the right's of martyrs." As the numbers increased in front of the ministry overnight, military police heightened security measures around the building's perimeter; hundreds of soldiers and tens of tanks were mobilised. At one stage, a military police officer spoke to protesters, warning them of the "consequences" of moving nearer to the security cordon. Military police forces also blocked the main street leading to the ministry.